Basically, Seo is known as optimizing a content which helps search engine to understand the purpose of that particular content. Mostly we have seen that Most of the Seo expert has their own thought and well-done experiences year by year but the fact is SEO is very simple but took lots of time to give you the result. So while doing SEO not means its one day game you have to keep patients to see SEO result on your site. And the thing high-quality SEO means you have the fully optimized content to satisfie the search engine Algorithm and its crawler. Here in this post, you will simply understand the basic concept of SEO and how it benefits you to get higher ranking on a search engine first-page result. What is SEO in your content and How it works? SEO is the fact that without doing SEO you cant satisfy the search engine the type of content you are providing to your Audience. That’s why while writing content doesn’t mean your work is done you need to properly optimize your content, which stands for SEO friendly content. Here SEO friendly content “Means” partition between paragraph and those partitions are divided and counter by the heading and subheading. As we search for any keyword on the search engine and the result we get to see on the first-page result are fully SEO optimized content and some website lay down and could not see in the top 100 pages result. Notable point – when optimizing your content into SEO friendly content you have to remember that how much long lengthy content you have, you can well optimize your content. Cause to use heading or subheading to your content you need more words contents, which you can use minimum 1 heading and 3 to 5 subheading. Actually, search engine focus on heading and subheading to understand the accurate purpose of that particular content. Now we all know that What is SEO and how it is simple and easy but very important fact to rise any content in search engine search visibility. Want to know more go through the link. My answer will be No, cause Search engine is well organized to text-based Machine learning and visualisation content are human being learning concept. And that’s why Many of SEO expert focus and provide information with their blog, vlog or through a webinar to their Audience. That the content divided by the or you can say between Heading and subheading are more focusing content, which helps you to increase your search visibility and improve your bounce rate. 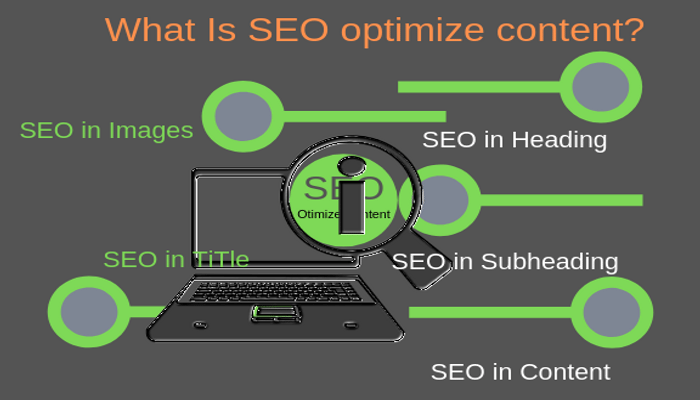 And such content is Seo optimized content and user experience friendly content. What is SEO in images and How to optimize images? There are several facts that your content should be SEO optimize content cause crawler crawl all features and material insight from your content. That’s why just placing images in your content Doesn’t means your work is done for example when you search any keywords on google at the sperate space in that particular pages you will get to see a images directories. Which have a web address for that particular image, “Means” if you placed an SEO optimized images in your content then your images should be seen in the search engine image directories for that particular main keyword. To optimize images you need to compress your image size and keep it below than 100 kb and once you compress your images its time to Give an address to your images. You have to copy your title and main keyword and paste it to your image Alt address bar. always remember whenever you give an Alt tag, you have to mention your main keyword in images attribute. 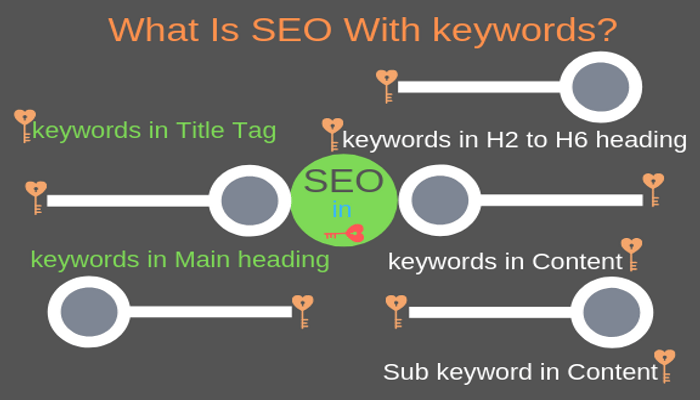 What is SEO in Keyword, How to optimize your content with keywords? To optimize content that can be listed by the Search engine you need to keep the right placement of your keyword to empower your search visibility in the search engine. Here keyword is a key point of your content, which help to properly keep understandable to the crawler to crawl your site content and make it visible to the user. Whenever any user type keyword on Google search engine or other search engines like Bing, Yahoo etc, Search engine match the keyword related to your content and make it visible in his search directories. So that’s the reason Why keyword placement is so important to empower your content ranking on search engine. Here keyword placement “Means” the keyword which tells the search engine that what kind of keyword content you have to deliver to your user. What is SEO in keyword placement? During keyword placement we have to keep in mind your keyword should be in the right place “Means” Don’t place a keyword or stuff keyword in your content. Your keyword must be user-friendly and have a look that your readability is good, Some times people stuff their keyword and lose their content readability. May keyword placement help you to increase your content search visibility on the search engine but while stuffing lots of keyword in your content list you in black hat SEO. 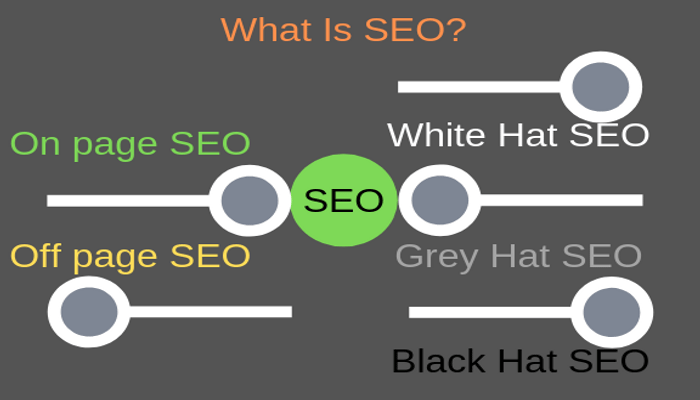 Actually, Seo is measurable in three-part White Hat SEO, Grey Hat SEO, and Black hat SEO. Want to know More check out this link. SEO Made Simple Step by Step Guide Mentioned in the upper paragraph. If you want to get ranking you have to look to keep the right keyword density in your content. 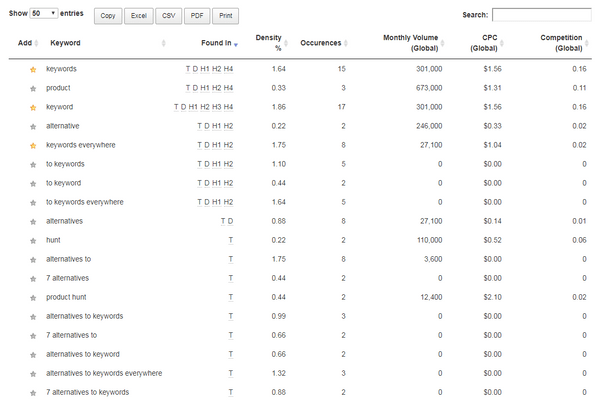 Here keyword density means a keyword which are suggested to your main keywords and called as a sub keyword. To get to know content keyword density then keyword everywhere is one of the best keyword tools to empower your content keyword density. Want to know How to master your content keyword density, check out this suggested Article link and I am sure that you can understand the hidden truth. That is the reason, Why the right keyword placement is so important to get your content visibility on search engine top 20-page result. Actually, keyword placement is the simple strategy, Which we can do easily, No need to be a professional SEO expert. 1- First placement of your keyword should be in your title. 2- And your next step should be placing the keyword in your Heading and Sub Heading. 3- keep your main keyword in all paragraph,” Means” you can push 3 to 4 keyword to all separated Heading paragraph. 4-Place your main keyword in images Alt tag. 5- Improve your keyword density in your content, “Means you have to put keyword which is mostly getting searches in the search engine. and those keywords are Which we used to write our content According to our Audience and Normally used to communicate in writing Attitude. Exp – If you are travel blogger you can improve your keyword density in your content with placing sub keyword like- Mountain, Fun, Work out and in the etc. There are plenty of keywords Which have High search volume and low competitor, and such keyword placement content is known as rich content. There are plenty of simple words which is normally used by the visitor on search engine with targeting their main keyword to find the result and solution on the search engine. keyword density is the most important part, While we learn about what is SEO in Digital marketing and How it benefits to empower your search visibility on search engine. And that is the reason why, when we check out any content, keyword density from the first-page result, We find lots of sub keyword with high search volume in their content. Which make a sense and make easy to understand by the crawler to crawl your content and index it in the right place, and make it visible. While any visitor search for keyword or sub keyword related to your content on the search engine. 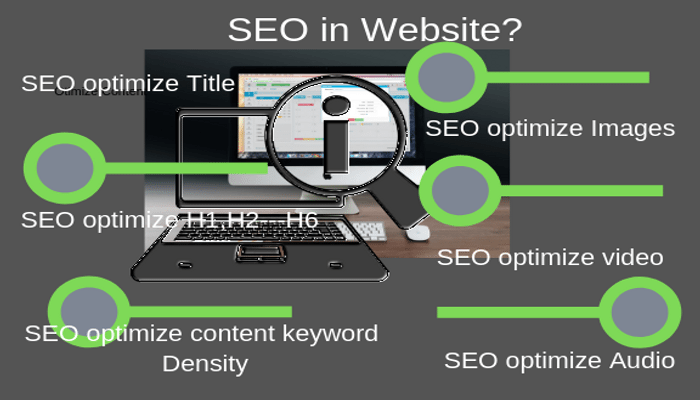 What is SEO in websites? In my opinion, SEO on the website is the hidden features of on page SEO and off page SEO, and both have the same impact to empower your website ranking. But both have a different effect, where On page SEO is the insight structure of the whole website and too friendly with search engine Algorithm and in the rare case you get the penalty with drop down your ranking. “Means” On page SEO also bad effect to get penalized with the search engine, While having a copy wright content in your Site, Copyright images and stuffing the main keyword in your content etc. But On page SEO is a genuine way to keep your content on Google search engine or other search engines like Bing and Yahoo etc top 20-page result. Cause of Huge competitor it took a long time 3 to 6 month even year depends on the competition for that particular keyword to see your On-page SEO benefits. But with Doing off page SEO Like – Creating Backlink, Guest blogging, Social sharing, Bookmarking, Directories submission, and Web 2.0 submission etc. Make easy to get a fast result to see your website on search engine top 20 lists. Actually, off page SEO help as a mediator. It provides a signal to the crawler that your content has the quality and uniqueness and loved by the Audience. And keep content updated to get crawler busy on your website. But off page SEO also have the bad effect which may cause to get penalized by the search engine Algorithm. “Means” While creating Backlink from paid Sources or getting a backlink from unusual spamming websites, involving paid visitor on your site to visit, Having a paid traffic from Social sites etc. Actually, there are plenty of off page SEO which may increase your search ranking and Also May let down your search ranking from the search engine list as a penalized website. So While doing On page and off page SEO Keep your website spamming free and get the genuine way to do on page SEO and off page SEO. How to write SEO friendly post For blogger or WordPress? In this post, I have mentioned My opinion thaught related to What is SEO and How one can increase their search rankings and empower their website search visibility on search engine top 20 lists. And you can also get the basic information about on-page SEO and off page SEO in Short Description.